FILE - South Korean and U.S. Marines take part in a winter military drill in Pyeongchang, South Korea, Dec. 19, 2017. The United States and South Korea have decided to delay joint military exercises until after the Pyeongchang Winter Olympics next month, officials from both countries said Thursday. South Korea’s Blue House (executive office) said the decision came during a phone call between U.S. President Donald Trump and President Moon Jae-in. 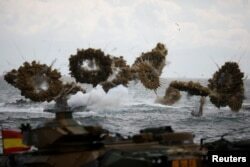 FILE - Amphibious assault vehicles of the South Korean Marine Corps fire smoke bombs as they move to land on the shore during a U.S.-South Korea joint landing operation drill as a part of the two countries' annual military training called Foal Eagle. U.S. Defense Secretary Jim Mattis downplayed the delay to reporters Thursday, calling it a “practical matter.” He said the exercises would resume after the March 9-18 Paralympic Games ended. The annual joint military exercises known as Foal Eagle are usually held between February and April and are one of the world’s largest such drills. The exercises combine ground, air, naval and special operations to increase readiness to defend South Korea and the region. North Korea routinely objects to the exercises. Earlier, Trump tweeted that his “firm” and “strong” leadership was the impetus for a scheduled resumption of talks between North and South Korea. On Wednesday, North and South Korea reopened a cross-border hotline that had been shut down since 2016 after North Korean leader Kim Jong Un offered to send a team to the Winter Olympic Games hosted by the South next month. After the reopening, South Korea confirmed that officials from both countries talked for 20 minutes, according to The Associated Press. 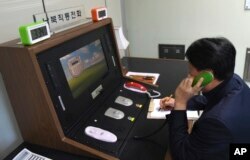 In this photo provided by South Korea Unification Ministry, a South Korean government official communicates with a North Korean officer during a phone call on the dedicated communications hotline at the border village of Panmunjom in Paju, South Korea. A Seoul official says both Koreas have agreed to hold their first talks in more than two years next Tuesday to discuss cooperation with the Games and improve diplomatic relations. 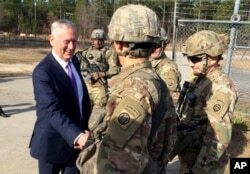 Defense Secretary Jim Mattis greets soliders at Fort Bragg, North Carolina, Dec. 22, 2017. “It is difficult for me to disassociate that he’s now wanting to negotiate on any issue, with months and months of unanimous United Nations Security Council effort,” he told reporters at the Pentagon Thursday. Mattis also warned that it was unclear whether Kim’s recent actions were “a real olive branch” or just a one-time move. North Korea has drawn increased scrutiny from the international community in recent months because of a number of missile launches and its sixth and most powerful nuclear test. Pyongyang has dismissed new sanctions and tough talk from the Trump administration as it continues to develop its weapons program, which North Korea has said is being developed to defend against U.S. aggression.